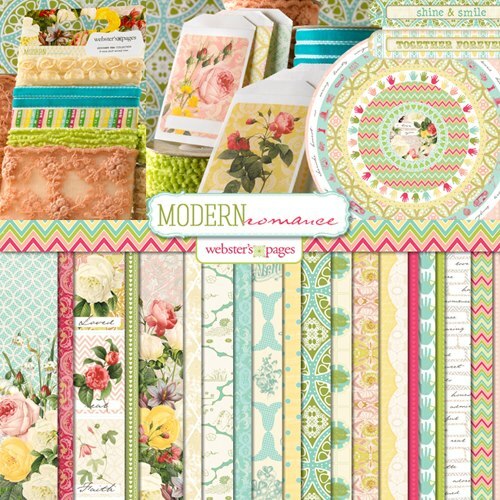 Erin Blegen: My Scrap Cabin: Please Welcome: "Modern Romance" from Webster's Pages~!! Please Welcome: "Modern Romance" from Webster's Pages~!! If you've been following the Webster's Pages blog lately, you have had the pleasure of viewing the new Clean & Simple collections designed by the fabulous Allison Kreft: "Composition & Color" and "Sweet Notes". Along with these amazing paper collections, packed full of color and incredible patterns, are a brand new batch of coordinating embellishments! But now it's time for some classic Webster's Pages, and Brandin O'Neill has been hard at work on some new designs herself! Today I get to share with you the NEWEST collection, called "Modern Romance", and I can guarantee any fellow Webster's fan that this range is to-die-for-GORGEOUS~!! *sigh*...SO much dreaminess to take in, huh?? Well, guess what? You can try and WIN this collection yourself by heading over to the Webster's Pages blog HERE and leave a comment in today's post to be automatically entered~! Thanks for checking out my project~ I'll be back tomorrow with another one, this time featuring the more feminine side of this collection. Now head on over to the Webster's Pages blog for your chance to be one of the first to own this amazing collection~!! Such a gorgeous collection, I love that handprint paper!! And lucky ducky you to be one of the first people to lay your golden hands on it :) :) :) you most definitely did it justice, this page is amazing!!!! Love all the fussy cutting, of course, and little Gunner pants!!! Call me in a bit, ok? This layout is so beautiful! I don't usually like the clean and simple line, but you made it look fabulous! Love that bird in the nest. This is so beautiful Erin. I was just looking at it over on WP blog! Love your color choices. Love the cluster of flowers and trims! Sweet picture of Gunner. SO cute! I love the colors on this one and those trims! And those cute little hearts! Dejligt LO, i de skønneste farver, og den lille "snemand" er super sød. knus morkaren. Безумно красиво!! Столько деталей! Обожаю твои работы! Спасибо за вдохновение! This turned out amazing!! Love what you've done !!! Amy, I am going to send you a copy of my customs form showing it was shipped 11/9/12...I have no idea why it would be taking so long! But I've heard customs can be a pain :(...hope you receive soon~! Awesome page Erin!!!! loooove the design and the cute pic! this collection is so pretty! I saw this on Webster's site and I loved it right away! It's so gorgeous, Erin! ooo what a delicious range of papers, and I love your layout.. love how you have cut the papers to make an interesting feature.. you create so beautifully! Wow! What a STUNNING page! Love this to bits! You have this amazing talent to transform papers into something amazing. Your design and placement is perfect. Love it.